Fiberstore has designed and developed ‘quality product with affordable pricing’ for communication infrastructure solutions. This position has been achieved through our core principle of delivering maximum performance through design excellence. We built our business and products based on high product quality, trust and excellent service. We want to deliver first class solutions and a first class service to our customers. MPO Fiber Optic Solution is a high performance, preterminated, modular system designed for high density Gigabit Ethernet Applications. It is a Plug and Play Solution that offers excellent performance and speedy installation. MPO Solution can support 10 Gb/s for link lengths up to 300 meters using laser optimized OM3 fiber, and up to 550 meters using laser optimized OM4 fiber, with a low insertion loss of 0.5dB. MPO Module employ high performance MTP adapters from US CONEC. MPO Ferrule is the key component of the MPO Solution is a 12 fibre MPO (multi fibre push on) connector with a housing footprint size of a SC Simplex connector in a single floating ferrule. MPO Solution uses US Conec MTP connector, who are the market leaders. These connectors are made of precision moulded thermoplastic with metal guide pins, precise housing with asymmetrical face that allow only one orientation into the adapter, to ensure polarity is maintained along the channel. The micro-core cables used in the MPO Cable assemblies gives about 65% reduction in the physical size of the cable per fiber when compared to traditional fiber cables.MPO Solution with 12 core LC quad adapters offers 72 LC terminations in 1U rack space using modular patch panels, and 336 LC terminations in 3U rack space using 3U Chassis. MPO Adapter Panel with 12 Core MPO connectors offers very high connectivity of 288 fibers and with 24 core MPO connectors it doubles to 576 fiber terminations in 1U rack space. Now the following is the Assemblies for Gigabit Ethernet. the rear of the units routed to the adapters of your choice in the front. MPO Module can be installed in 1U Sliding Patch Panel and 3U Chassis. 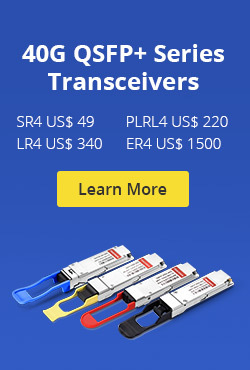 They are available with LC and SC connectors, with a choice of Singlemode, Multimode OM3 and Multimode OM4 connectivity. MPO Trunk Cable Assemblies are designed for high density application which offers excellent benefits in terms of on-site installations, time and space saving. These plug ‘n’ play solutions uses micro core cables to maximize bend radius and minimize cable weight and size. MPO Trunk Cables are factory preterminated, tested and packed along with the test reports. Complied with the standard TIA-568C.3-2008 and YD/T1272.5-2009, it was widely used in the pre-terminated system of the IDC and blocks. 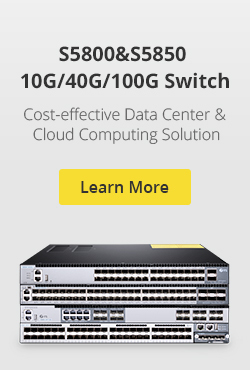 This system applies to the 10G Ethernet transmissions and it is also available to the updated system for 40G/100G in the future. MPO trunk cable helps to fast installation for Data Center and other Fiber Optic environment. Its efficient plug and play structure which can significantly lower the installation and daily maintenance costs surpasses MDA, HDA and EDA regional module cassette or fan-out fiber connections. The high quality fiber optic cable and MPO accessories makes up the Linkbasic MPO Trunk cable and provides lower insertion loss and higher return loss so that it fully complied to the high speed network system. Fiberstore MPO cables are designed to offer a high degree of flexibility through available features and options, allowing each cable to be manufactured to fit the exact application. With the multitude of applications and requirements most Multi-Fiber MTP-MPO Breakout cables have. Fiberstore has established an extensive list of standard options ensuring each cable is designed and built to fit your need. Now the following is the MPO Breakout product from Fiberstore. MPO Breakout Cable Assemblies are designed for high density applications which require high performance and speedy installations without onsite terminations. MPO breakout cables are numbered for full traceability. Available in 12 core configurations, these space saving assemblies come with either MPO Male or MPO Female Connectors on one end and LC or SC Connectors on the other end. Fiberstore MTP MPO cables are available in single mode, multimode, and laser optimized fiber types, multiple jacket/construction types for different applications, fiber count from 2-72 fibers, and breakout style/length. This entry was posted in MPO/MTP solutions and tagged MPO Breakout Cable, MPO Cassette, MPO trunk cable on August 11, 2014 by Amelia.Liu. The increasing demand on today’s higher fiber counts has exploded the development of multi-fiber technology. FiberStore is one of the main manufacturing of MPO/MTP fiber patch cable and cassettes, and many other MPO/MTP fiber interconnection products, which engineers unique MTP solutions using 12, 24, 48 and even 72 fiber MTP ferrules. What is an MTP Trunk Cable? 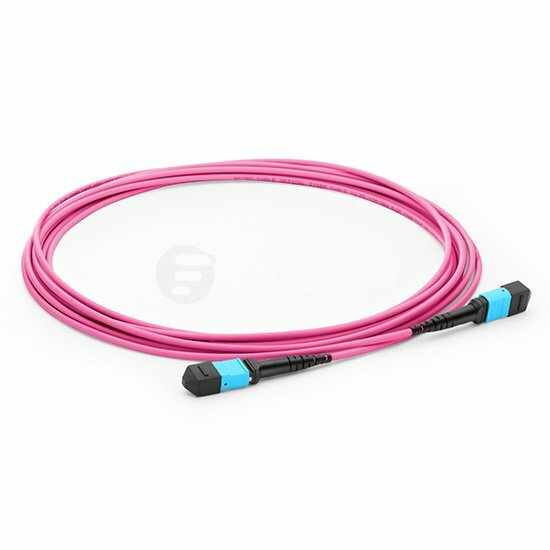 An MTP trunk cable provides 12 to 144 fibre connectivity, by using 12-fibre push/pull optical connectors, it minimized errors and reduced spaces. The MTP trunk cable allows for lower bend radii and smaller slack loops. It enables up to 6x the cable tray capacity over traditional bulkier cabling solutions, saving up to 65 percent space. MPO trunk cable features round furcation legs that provide easy routing and improved storage. With the small profile furcation plug, it allows stress free cable mounting, leaves no legs outside the housing and shipped with strain-relief mounting cradles. What is MTP Extender/MTP Extension Trunk? The MTP extension Trunk extend subsets of links from zone distribution into equipment zones, which feature pinned (male) MTP connector on one end and non-pinned (female) MTP connectors on the other. It pinned MTP side mates with trunks via MTP connector panels, while not pinned MTP side plugs into modules or harnesses. MTP couplers are simple plastic rectangles that hold two MTP connectors together. One cable going into an MTP coupler needs to have a male connector. The other cable must have a female connector. MTP couplers can be either key-up to key-up, or key-up to key-down. MTP cable has a clip on the top of the connector. On a key-up to key-up coupler, the clips are pointed in the same direction on both of the cables. On a key-up to key-down coupler. On a key-up to key-down coupler, the clips are on opposite sides. This also affects the polarity of the signal. Key-up to key-up couplers invert polarity. Key-up to key-down couplers retain the original polarity. This was initially counter-intuitive to me. It made sense once I thought about it though. An MTP harness breaks out 12 fiber MTP terminations into LC duplex connectors. It connects to trunks through a pinned MTP connector plug into dual fiber electronics ports with LC uniboot duplex connectors. It is occupying less space than 6 duplex jumpers improve airflow for cooling efficiency. By easing handling of cable connections on high-fibre count SAN directors and switch blades, it enables higher density in equipment patch panels. MTP harnesses are available in two lengths: short harness legs for minimal cable slack and long harness legs for mounting flexibility within a cabinet. This entry was posted in MPO/MTP solutions and tagged fiber patch cable, MPO trunk cable, MTP cable on December 6, 2013 by Amelia.Liu.